A Syrian-backed declaration on the “right to peace” is what a UN working group is seeking to draft during a week-long meeting at the UN Human Rights Council which opened yesterday in Geneva. While all 193 UN member states can attend the sessions of the working group, only some 30 are attending, along with another 20 NGO activists. 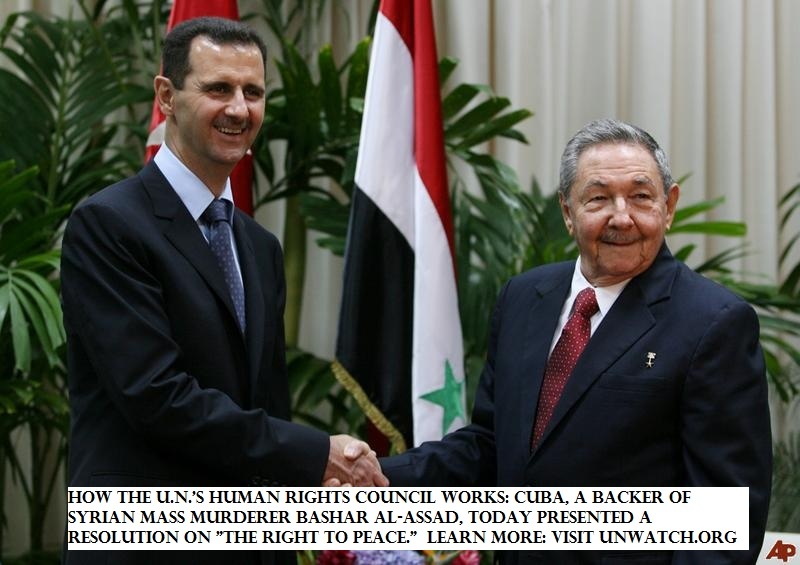 Key backers of the “right to peace” include Cuba and Syria. One of the goals of such human rights violators is to erode the Responsibility to Protect (R2P) principle, which calls for the international community to intervene in instances of extreme human rights violations such as genocide. GENEVA, July 5 – The U.N.’s top human rights body defied the U.S. today by adopting a Cuban-led “right to peace” resolution that endorses a draft declaration (see Art. 7) calling for resistance against “foreign occupation,” for the first time granting U.N. Human Rights Council legitimization of the terminology used by Middle East extremists to justify terrorist attacks against Americans and Israelis. The Geneva-based human rights group UN Watch expressed serious concerns over the text. Syria’s Assad regime has its hands full murdering its own people in Homs, Hama and Damascus. Yet somehow it managed to find time today to successfully co-sponsor a “Right to Peace” resolution, adopted today by the U.N. Human Rights Council, that endorses a draft declaration (see Art. 7) calling for a right of “resistance,” a term used in the Middle East used to justify terrorism. Only the U.S. had the courage to oppose the Orwellian text. Here is the U.S. statement explaining some of what’s wrong with the text. The exercise will cost over $300,000 to implement. What the U.S. did not mention, however, is that the resolution calls for a new declaration to be based on a draft that legitimizes terrorism. By promoting a “right to resist and oppose oppressive colonial, foreign occupation,” the council effectively gives a nod to the “resistance” justification commonly used by Al Qaeda, Hamas, Hezbollah and other terrorist organizations to launch attacks against Americans, Israelis and others. Led by Cuba, the resolution’s co-sponsors included Syria, Iran, North Korea, Sudan, Belarus, China, Palestine, Sri Lanka, as well as Venezuela and its allies Bolivia and Nicaragua. The draft declaration was prepared by the council’s 18-member Advisory Committee, a rogues gallery that includes the pro-Ahmadinejad Miguel d’Escoto Brockmann; Jean Ziegler, co-founder of the Moammar Qaddafi Human Rights Prize; and Halima Warzazi, a former defender of Saddam Hussein. Thanks to UN Watch, all three are on a congressional watchlist. Today’s vote result: 34 in favour, 1 against (USA), and 12 abstentions (Austria, Belgium, Czech Republic, Hungary, India, Italy, Moldova, Norway, Poland, Romania, Spain, Switzerland). the U.N. Human Rights Council, July 3, 2012.